The dry ripe seed of the deciduous lianoid shrub lianoid machaka of Quisqualis indica L. of family Combretaceae. Guangdong, Guangxi and Yunnan provinces in China. Collected in September and October when the peel turns purplish black. Dry, large, full and round without oily looking, and pale yellow. Dried in the sun; husked, unprocessed or stir-baked fragrant. Kill parasites and promote digestion. and so on in Shi Jun Zi Wan from Tai Ping Hui Min He Ji Ju Fang. For enterobiasis, it is also combined with Bai Bu, Bing Lang and Da Huang. Smash it and decoct 9~12g; stir-bake it fragrantly. Take 6~9g when chewed and swallowed. 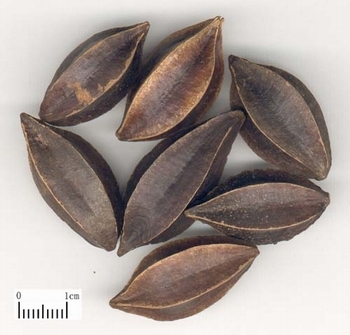 Take l~l.5 pieces of the seeds per year of age. The total amount should not exceed 20 pieces daily. Take with empty stomach, once a day for 3 consecutive days. Large dosage or taking with hot tea can cause hiccup, vertigo, vomiting and diarrhea. Therefore it should not be taken with hot tea.